I absolutely love baking and decorating cakes…especially for my family members! In my family, I make everyone’s cakes for their birthdays and special events. Every year my nieces, nephews, and cousins think long and hard about what kind of cake they would like and send me pictures, drawings, and ideas. This cake is one of my absolute favorite cakes I have made! My nephew’s birthday was approaching so I asked him and my sister to start thinking about what kind of cake he wanted. After several weeks of thinking, my nephew came over to my house with his dirt bike helmet and handed it to me, he LOVES to ride his dirt bike and competes in many competitions too. I was unsure of why he was handing it to me when he said, “This is what I want my cake to look like.” Oh boy…I had never made a helmet cake before! Of course, I had to give it a try. My sister kindly told my nephew, “You know it might not look JUST like your helmet.” My nephew’s response was, “Yes it will! I know Karee can do it because she is the best!” I knew I had no choice but to do my best and to make sure his cake was an exact replica of his helmet…I just couldn’t let him down! I used circle cakes on top of a sheet cake and carved the shape of a helmet. 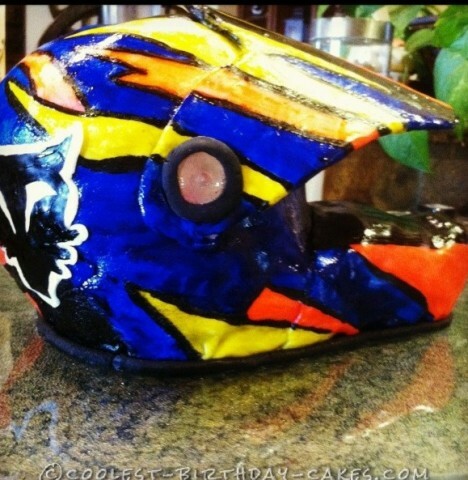 I covered it with fondant, and painted the designs to match the designs and colors of his actual helmet. When I arrived to the party with the cake, everyone that worked at the venue came out to see the cake. My nephew was so excited and loved it! When it was time for cake my grandad asked, “Where is the cake? I didn’t see it?” He thought it was the actual helmet sitting on the table and had no clue it was the cake! What a fun cake it was!